Are you overwhelmed due to stress in your family that is magnified by the presence of a mental illness? The Family Connection is a monthly support group for spouses, parents, siblings, and other caregivers who are seeking support to more effectively deal with the stresses created by the symptoms and/or behaviors of family members who have been diagnosed with a mental illness. Dealing with a family member who has symptoms of depression, bipolar depression, schizophrenia, anxiety disorders and others can be a significant stressor for other members or caregivers in the family. We learn about the various types of mental illnesses, medications, empathy, healthy boundaries versus enabling, stigma and talk about possible ways to respond to various behaviors of the family member. Sessions are facilitated by Jim Vander May, LMSW, Clinical Social Worker. Required first time only. Call the Southwest Clinic at (616) 222-3700 to RSVP or for more information. Sessions are free; however, donations are accepted. For more information or to register for the Family Connection, please call 616.222.3700. 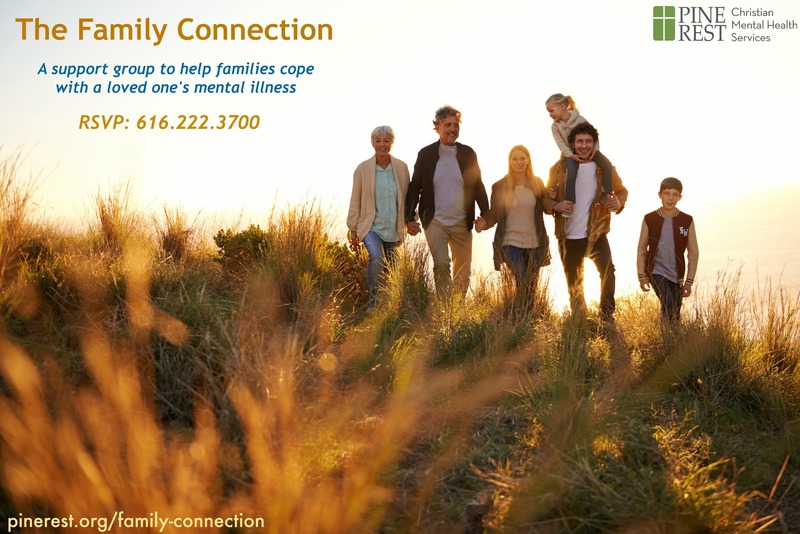 The Family Connection is a support group for spouses, parents, siblings and other caregivers who are seeking support to more effectively deal with stresses created by the symptoms/behaviors of family members who are diagnosed with a mental illness. I am a caregiver for my adult son. Do I take him to the meeting? No, the support group is just for caregivers. Check with the local chapter of NAMI for services for your family member. Must I attend a certain number of sessions? Come as often as you wish. It might benefit to attend several at first. Do I have to tell my whole story or can I just come and listen? I encourage members to share whatever they are comfortable sharing and sometimes it’s just to listen. No, but you might decide to do some research on your own. They vary a lot. I have anywhere from 2 to 10 at one time. What do I do when I walk into the clinic? Just go to the window and let the support staff know you are here for the support group. At 5:30 I come into the waiting room and gather the group to go to meeting room. Where is the Pine Rest Southwest Clinic? The Southwest Clinic is located at 4211 Parkway Place, Grandville MI 49418. The building faces “old” 44th Street between Canal and Wilson. Or, you may call the clinic at 616 222 3700 number and select the prompt for directions.